Drawings 1-8 have all been attributed to Robert Baldwin (fl. 1762-c.1804). The inscription of drawing 1 and the numbering of subsequent drawings are in his hand as are the room labels. 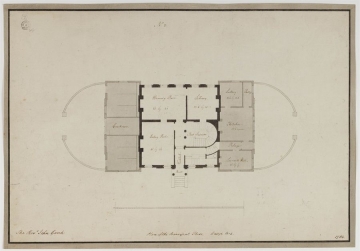 Other drawings from Soane's early practice also attributed to Baldwin include drawings made for the dairy at Hammels Park, Blackfriars Bridge in Norwich and Letton Hall (q.q.q.v). All made in 1783-4 when Soane (who was without office help until he acquired his first pupil in September 1784) relied on ad hoc assistance from Baldwin. The rendered drawings (elevations) made for Saxlingham were evidently done in a hurry, lacking Baldwin's usual finesse but with his favoured green washes.